Life with two school-aged children, a toddler, and a baby is busy. Obviously! The after school rush is the most difficult part of my day. Dylan and Lexie want to share their days with me, Lily is usually waking up from a nap, and Liam is hungry. There is homework-LOTS of homework-that needs to be done and there are four kids fighting for my attention. The last thing I want to worry about is figuring out what we're eating for dinner! I planned meals for several years and it worked well for my family. About a year ago, I decided to make monthly meal plans. This method keeps me so organized in the kitchen! It is one of my favorite time-saving tips for big families. To start, I came up with a list of our favorite meals. I asked for input from Grant, Dylan, and Lexie. I also asked my friends to share their favorite quick and easy meals. Once my list was completed, I looked at my calendar and picked a day to start my monthly meal plan. I shop for groceries every other Friday. My new monthly meal plan starts on the Sunday following my first shopping trip of the month. I plan enough dinners for 28 days. Right before I grocery shop, I sit down with my calendar for the month, and figure out how many dinners I will need to make in that 28 day span. Once I eliminate our once a week meals with family, and allot for 4 additional days where we would have dinner with other family/friends or eat out, I only need to come up with 20 meals. That number will vary depending on holidays and birthday parties, too. 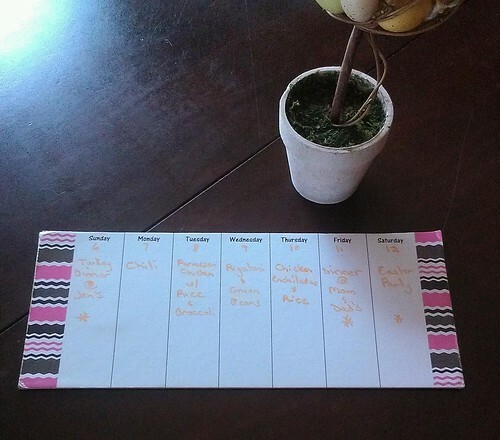 After I figure out how many dinners I need to make, I pull out my list and start adding meals to a paper calendar. In addition to our favorites, my goal is to try 1 new recipe a month. I usually find this recipe on Pinterest or Allrecipes. Once I have a completed list, I add the ingredients I need to my shopping list, then stock up my pantry, freezer, and refrigerator. I always buy a large selection of fresh and frozen vegetables for healthy side dish options! My final step is writing out a quick weekly meal plan on a dry erase magnetic board. I put it on the front of our refrigerator so nobody pesters me about what's for dinner! This may seem like a lot of work at first, but once you have a list of your favorite meals completed, this process is quick and easy! I do not meal plan for breakfast and lunch. With the exception of big breakfasts, I just let each person choose their own breakfasts and lunches. Once you have a master list of meals, the entire meal planning process, with the exception of shopping (which you have to do anyway! ), takes about 10 minutes. This method saves me so much time and energy! I always know what's for dinner and I never have to run to the store for ingredients. That's a win! Do you meal plan? What are your favorite meals? I love meal planning! I've gotten so bad about it lately and our budget shows- we've been eating out way too much! I'm back at it this week and it is so much easier knowing what's on hand to cook! Love the sample meal plan! I really need to start doing this, I keep saying I am going to do it but never do lol. I love your meal planning system. My latest favorite is cooking a whole chicken in the crock pot. Easy and it works into several meals and salads! I'm impressed!!! I'm trying to get back into meal planning - I only do it weekly currently, but have a hard time keeping up with it! Oh - can you share some of your fav recipes sometime? A lot of those sound really tasty! This is beyond impressive. I weekly meal plan as I shop once a week. This seems very intimidating but awesome at the same time. And I really need to get a list of our favorite dinners together. Would make my meal planning so much easier. Yep, we do the same thing! Wow, this is great. I do my meal planning on Sunday's before my grocery store run. I love cooking, but let's face it during the week is tough, so easy meals are a must!